Uproar in Heaven, also known as Havoc in Heaven, is a Chinese animated feature film directed by Wan Laiming and produced by all four of the Wan brothers. 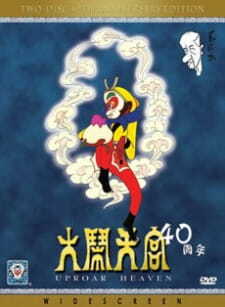 The film was created at the height of the Chinese animation industry in the 1960s, and received numerous awards. It earned the brothers domestic and international recognition. The story is based on the earliest chapters of the classic story Journey to the West. The main character is Sun Wukong, aka the Monkey King, who rebels against the Jade Emperor of heaven. It became one of the most influential films in all of Asia, animation or not. Countless cartoon adaptations that followed have reused the same classic story Journey to the West, yet many consider this 1964 iteration to be the most original, fitting and memorable.